Should you be giving the pro-life vigil a miss. 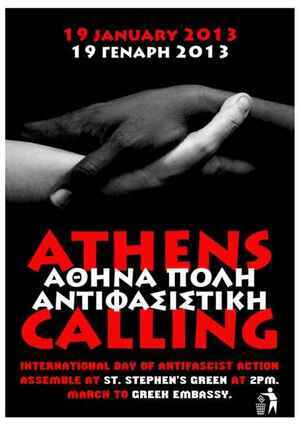 The Dublin offering on Saturday to an international day of solidarity with Greek anti-fascists to highlight the rise of the genuinely scary Golden Dawn party. Chilling, short video on them here. They make Aine look like Gandhi. Posted in Misc and tagged Greece at 8:29 pm on January 16, 2013 by Broadsheet.